One of Northern Ireland’s best known companies is celebrating its 160th Anniversary this year and marking the milestone by launching a special collection of items reproduced from its archives. 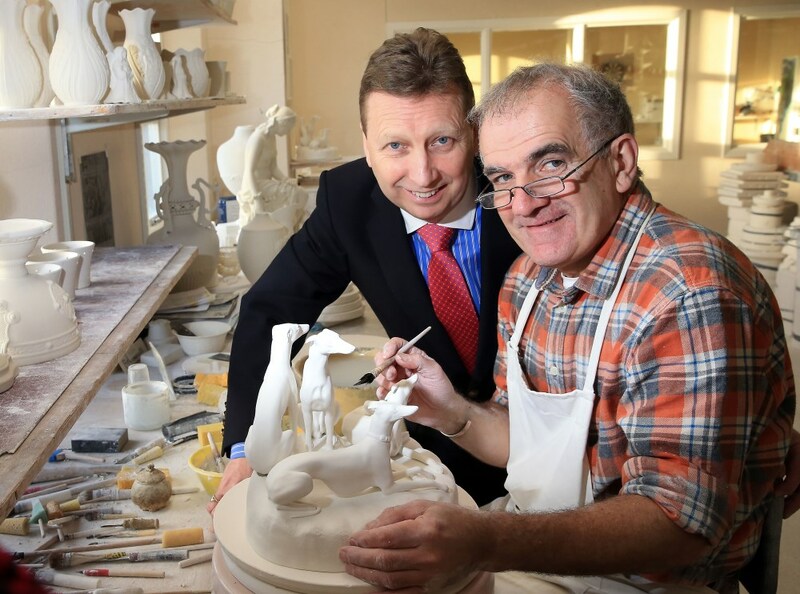 Belleek Pottery was established in 1857 and to commemorate 160 years of continuous production at the Fermanagh pottery, items from the company’s archives are being reproduced as a special, limited edition collection. The 16 pieces, one from each decade of production, have been chosen to illustrate the unique creativity of Belleek craftspeople across its history. Among the products included in the collection are – ‘The Group of Greyhounds’ figurine circa 1860s; ‘The Henshall Handled Basket’ circa 1890; ‘The Round Tower Centrepiece’ circa 1900 and ‘The Harp Butterdish’ circa 1930s. “There are very few businesses that survive to celebrate 160 years in continuous operation. It is perhaps even more remarkable that a small pottery in the remote north west of Ireland that was established to provide much needed employment for local people in the wake of the Irish Famine has gone on to build such a highly regarded international profile and reputation. Belleek continues to be a highly collectible brand and the Archive Collection is being launched to give Belleek collectors the world over the opportunity to own some of the most iconic items ever produced by the company. Just as in 1857 all the items in the collection are handcrafted in Belleek, reproduced using the original drawings and moulds by craftspeople, many of whose parents, grandparents and even great-great grandparents worked in the pottery”. From its early beginnings all Belleek Parian China pieces have been back stamped with the distinctive Belleek trade mark. The earliest products known as First Mark Belleek were stamped with a black trade mark and each piece in the 2017 Archive Collection will be back stamped with a specially designed 160th Anniversary trade mark also in black. The Archive Collection will be unveiled to Belleek’s international retail market later this week at the giftware trade show Showcase Ireland in Dublin.